Thought we’d be better off with a brand new thread for next season and the following seasons. Makes it easier than creating a new thread every year. Whenever GTF days comes round this can be moved to the Championship forum. I don’t expect many Ayr fans will have recovered from what happened yesterday but I thought I’d start this anyway to give folk a chance to discuss next season. The Super, a great bunch of lads. 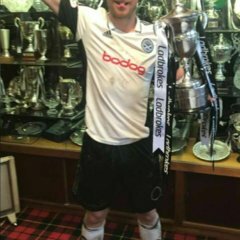 I don’t think I’ve ever wanted someone to stay as much as Shankland. Most players are replaceable - in the current market I don’t think he is. I’m sure the rest of the championship won’t see it this way (as he had one bad season there) but I’m confident he will score at least fifteen in the league if he stays. No idea about the status of Rose, Adams, Boyle, Forrest and Moore. I think Crawford, Shankland, Kerr, Adams and McGuffie might be out of contract? Don’t think Doc is under contract. I’m sure it’s just Moff, Geggan, Higgins and Bell. Docherty isn't. Bell is. think that's it. Try and get Crawford, Shankland, McDade & Rose signed not bothered about anyone else. Think Crawford is away regardless, seems like he wants a new challenge after six years here, and I wouldn't begrudge him that. Glad he got to go out on a high. Slightly harsh on Ferguson as I think he’s decent but we need to upgrade our defenders. We need to strengthen big time keeping these guys means relegation. Hart, Doc, Adams, Kerr & possibly Forrest need to go. Forrest and Doc are more than capable at Championship level. Kerr is as well but I don’t imagine he’ll play many games and wouldn’t be surprised to see him as a player/coach. Hart is young and shouldn’t be written off so early. If he stays and an experienced goalie comes in then I’ll be happy. Not what he was suggesting last night. Forrest and Docherty were uninspired last season in the championship and in Docs case is injury prone. I am unconvinced but will bow to McCalls judgement. Kerr has been good at league one level but think he’s too old for the championship. Forrest was our top goal scorer last season while playing out of position with no support. Doc did well when he was fit and did especially well in the couple of games against Hibs at Easter Road. I think Kerr’s experience is vital and he might only play a dozen games but it could make all the difference. As I said don’t write Hart off at such a young age. He’s done well since being brought back into the fold. Just as well I said `think` then. He isn’t dreadful, a young keeper who made mistakes early in the season but came back in and did well. As mentioned before he’ll be back up to a more experienced goalie who will hopefully help him along. Complement the existing starting side with three quality additions plus one or two squad players and we are good to go. No point ripping up the excellent spirit that side has.